Gauteng residents wanting to know more about the SA National Defence Force (SANDF), including what keeps the military on the march, should take time to visit the Rand Show this month. In addition to a wide array of equipment and weapons, the SA Army will have a working cooking unit up and running for the duration of the show, from April 18 to 28 at Nasrec, where military caterers will prepare food for public sampling. While old soldiers might wonder what happened to the “dog biscuits” that came from Anderson’s in Kokstad, they will certainly enjoy a display of airborne capability led by the Hawk Lead-In Fighter Trainers of 85 Combat Flying School based at AFB Makhado. One of these aircraft was involved in a landing incident late last month, damaging its nose wheel. With at least some Hawks set to grace Gauteng skies it appears the fleet has not been grounded following the incident. The Rand Show arena will also host precision drill displays by squads from both the Army and Navy and realistic demonstrations of airborne capability and the dogs and motorcycles of the Specialised Infantry Capability will also show their effectiveness in, among others, border protection and control. The Army will also have Elac simulators and a missile simulator on display and working for potential soldiers to test their shooting and firing skills. For those more interested in the maritime side of the SANDF, the Navy will have a 3 metre diving tank and a two man decompression chamber at the show. In addition to showing off its emergency medical, disaster and search and rescue equipment, the SA Military Health Service (SAHMS) will have suitably qualified corpsmen giving first aid briefings. 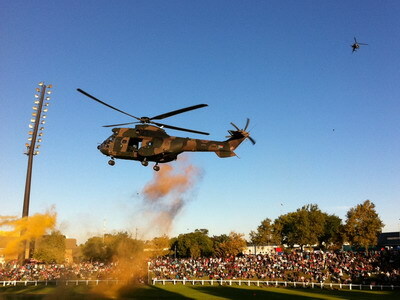 The SA Air Force (SAAF), in addition to its fighter trainers and an Oryx helicopter, used for delivering airborne infantry for the arena display, will have Umlindi radars supported by technical and operations cabins as well as a mobile air traffic control tower up and working for the duration of the show. The SAAF Museum is also playing its part and will put up and man an exhibit of military aviation memorabilia.